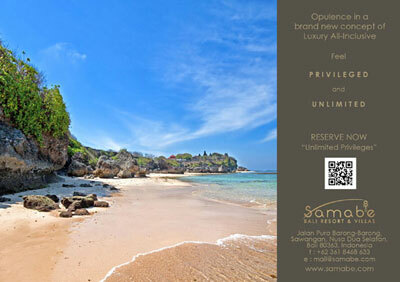 Samabe Bali Suites & Villas – soft launching on June 1, 2013 – is the first luxury Bali resort to offer the fresh concept of luxury all-inclusive. All guests at Samabe receive standard benefits called "Limited Privileges", which include daily breakfast; daily free flow of fresh juices, soft drinks, coffee & tea; daily afternoon tea; daily fresh fruit platter; 24-hour butler service, unlimited use of non-motorized water sports and more. Mini bar is refilled daily, and Wi-Fi connection is available in all guest suites or villas and in public areas at no additional charge. Guests can also have access to all resort facilities, such as main swimming pool, fitness centre and gym track, and all scheduled activities, such as cliff yoga and taichi. Guests who wish to take the luxury experience to the maximum the resort offers can sign up to the Unlimited Privileges that will give them all of the standard benefits plus additional list of premium benefits, at a surcharge. Return airport limousine transfer & immigration assistance at Bali airport (excluding any fees, such as visa on arrival). This particular benefit applies for direct booking or website booking only. Some of the activities are for adults and children at certain ages. Advanced bookings are highly recommended. For detail information, please check here or email us at mail@samabe.com.